Congrats to Ride New Orleans, our August Grant Winner! Ride New Orleans’ CBD Transfer Station Campaign, “Giving Transit Riders The Seat They Deserve”, will send a message to decision-makers in New Orleans: invest in a true CBD transfer station that provides basic comforts to current riders and encourages new ridership from tourists and residents who typically drive. More than 40% of RTA riders wait at the transfer point for 45 minutes or longer, and there are no public restrooms, route maps, shelter, and very few places to sit. Please join us at our next Awesome Hours event – Saturday, August 17th (3pm-5pm) at Tru Rootz Natural Hair Salon, 3351 Kabel Drive, Suite D. We’ll present a $1000 check to this month’s winner, Ride New Orleans, and they’ll talk about their AWESOME campaign! After the check giveaway, trustees will be available to talk one-on-one with YOU about your project ideas and help you to apply. Remember, we make $1000 grants every month. Proposals are now being accepted for the September grant cycle. So if you applied, but didn’t receive a grant during this cycle, we encourage you to re-apply! 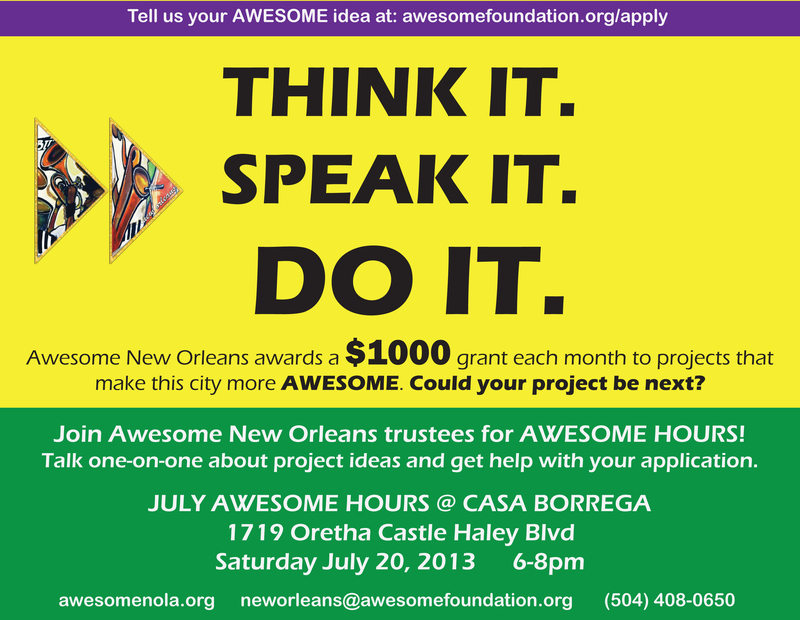 About Awesome New Orleans: Launched in January 2013, Awesome New Orleans awards monthly $1,000, no-strings-attached grants for “civic media” and “social good” projects to applicants in the Orleans Parish area. We accept applications from everyone who has a great idea– individuals, community organizations and nonprofits alike. Click here to apply!! Each month, Awesome New Orleans goes out into a different part of New Orleans to spread more AWESOME. We present the check to that month’s winner, share info and invite people to get involved with Awesome New Orleans, AND talk with interested potential applicants one-on-one about their awesome ideas!! July Awesome Hours was held at Casa Borrega, a great new restaurant on O.C. Haley with delicious authentic Mexican food and a colorful, ecclectic, comfortable ambience. Our July winner was Voice Of The Ex-Offender for their awesome project, Campaign To End Employment Discrimination. Gahiji Barrow, V.O.T.E.’s Program Assistant, accepted the check and shared a bit about the project. Check it out! 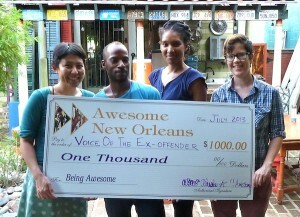 July Awesome winner, Voice Of The Ex-Offender (www.vote-nola.org), for their Campaign To End Employment Discrimination. Gahiji Barrow accepted the check on behalf of VOTE. We’re happy to support this AWESOME idea! Congratulations to July’s grant winner – Campaign to End Employment Discrimination! Campaign to End Employment Discrimination, a project of Voice Of The Ex-Offender (VOTE), is a media outreach campaign aimed at encouraging employers to hire ex-offenders. VOTE is a grassroots organization dedicated to the economic empowerment and civic engagement of formerly incarcerated people and their community. Please join us at our next Awesome Hours event – Saturday, July 20th (6-8pm) at Casa Borrega, 1719 Oretha Castle Haley Blvd. We’ll present a $1000 check to this month’s winner, Campaign To End Employment Discrimination. After the check giveaway, trustees will be available to talk one-on-one with you about your project ideas and help you to apply. Remember, we make $1000 grants every month. Proposals are now being accepted for the August grant cycle. So if you didn’t receive a grant during this cycle, we encourage you to re-apply! So you’re interested in applying for an Awesome New Orleans $1000 grant? Since we launched in March, we’ve received nearly 100 applications and have given away a total of $4000 to projects that make New Orleans more AWESOME! With the word spreading about Awesome New Orleans, I thought now would be a good time to let y’all know how we make decisions about granting. SO, you may not know that we give out $1000 grants to civic media projects eight months out of the year. The other four months of the year are open. To read more about civic media, click here. Every month, each trustee votes on the top three projects s/he thinks should be awarded. Whichever projects get the most votes are discussed at our monthly trustee meeting. Projects that are not civic media focused do not make it to discussion (during the civic media months). Community Engagement – we love projects that are community-based, community-connected and representative of its target community. Projects that are about building community and that engage members of the target community win over projects that are only beautiful. Social Justice – we love projects that are about fostering equity and justice. Marginalized Groups – we support projects that prioritize groups of people who are often overlooked (esp. “people of color”, women, and poor folks). Youth – we support projects that address issues related to disadvantaged youth. Creativity – we like to encourage “out-of-the-box” thinking. We want to see new and fresh projects, non-traditional ideas. Besides that, we like to support projects that could have a “ripple effect,” an impact beyond the project itself. And we’re not afraid to fund projects that don’t have other funding sources. Somebody’s gotta be the first! Finally, we like to support projects that are just FUN. This is list is by no means a strict criteria for decision-making, rather it’s meant to provide a window into our process. We also fund projects that don’t fit into any of these categories as well! So now that you know a little more, you may feel inspired to apply for a $1000 grant for YOUR project. Click here to apply! Note: We only review grants for that month’s grant cycle. So, if you applied for a May grant, we will only review your application in May. We will not review your application for future grant cycles. If you want your application to be considered during another grant cycle, you must apply during that grant cycle. The good news is – you can apply as many times as you want!! In March, we gave our first $1000 grant to Creative Futures to train high school students to plan, produce, interview and speak on “Crosstown Conversations,” a show on local radio station, WBOK. SO, how are our inaugural grantees doing? We recently checked in with them and found out that they hosted an art exhibition at the McKenna Museum last month! Creative Futures gets AROUND! Check it out. CANO’s Creative Futures, in partnership with John McDonogh High School, connects students to career and educational opportunities in the creative fields. Talented aspiring visual artists from John McDonogh showcased their original pieces at the McKenna Museum during Mothers’ Day Weekend. May 11, 2013. All art work was available for sale. Out of 26 paintings, 18 were sold!… Please support these students by posting positive comments that will encourage them to continue being artists!! Every month, Awesome New Orleans gives a $1000 no-strings-attached grant to a project that makes New Orleans more AWESOME. Our giving focus through August is “civic media”… projects that involve spreading information in community. Click here for more info about our giving focus. Could you be July’s grantee? Apply for a grant today! This month’s grant cycle ends Monday, June 24, 2013. Awesome Hours – June 15 @ Community Books! 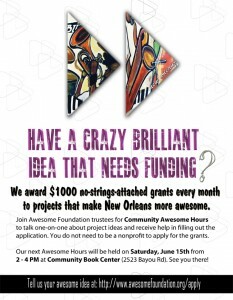 Come to Awesome Community Hours this Sat (6/15) at Community Book Center on Bayou Road. Meet June’s grant recipient – Conexiones! 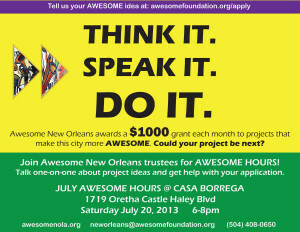 And talk to Awesome NOLA trustees about how YOU can receive a $1000 grant for your awesome project!! We’re looking for someone to fill a part-time (10-15 hours a week) position as the Dean of Awesome New Orleans for the next 12 months! The ideal candidate is someone with excellent organization skills who can balance a wide range of tasks and manage communications with the 20+ trustees and members of the wider Awesome community in New Orleans. She or he should be comfortable with social media and traditional promotion alike and eager to learn. Excitement to learn about, support, and work with New Orleans’ social enterprise, artistic, and social justice communities is a must. Please send your resume and a cover letter to neworleans@awesomefoundation.org by May 5th at 5pm. – Potential for travel to Awesome Foundation Summit in New York. – Work from wherever you’d like! – Be an ambassador for awesomeness in New Orleans! In the next year, Awesome New Orleans will give out eight grants through the Institute on Higher Awesome Studies’ partnership with the Knight Foundation to projects that make journalism, civic media, and community engagement more awesome in New Orleans. The other four months of grants will be focused on general “social good” projects. We’ve already gotten a lot of questions about what exactly these “community information and engagement” grants will fund. We’re being vague on purpose–we simply don’t know all of the awesome ideas New Orleanians can come up with, but we can tell you that we will be judging projects based on whether they inform and engage the community. This could take a lot of different forms: a documentary project to capture oral history, a campaign to educate specific neighborhoods about a public health issue, a project addressing the digital divide, or a block party aimed at organizing neighbors. If your project is intended to educate, organize, or empower a New Orleans community, it likely qualifies! So is this just about supporting journalism? Journalism is an important part of how people get information about news, events, and issues in their communities, but it’s by no means the only way. That said, we’re definitely interested in your awesome ideas for robust community journalism project, but we also encourage creative submissions around how information circulates and engages people in your community. What other criteria are you looking for? As with all Awesome Foundation grants, the trustees make the decision and each have their own set of priorities and interests. In general, however, projects where $1000 can make a big, meaningful impact tend to do better than those that have a much higher budget. Points are given for creativity, originality, thoroughness, and community impact. And of course, we want to see that you’ve thought the plan through and can actually make it happen! 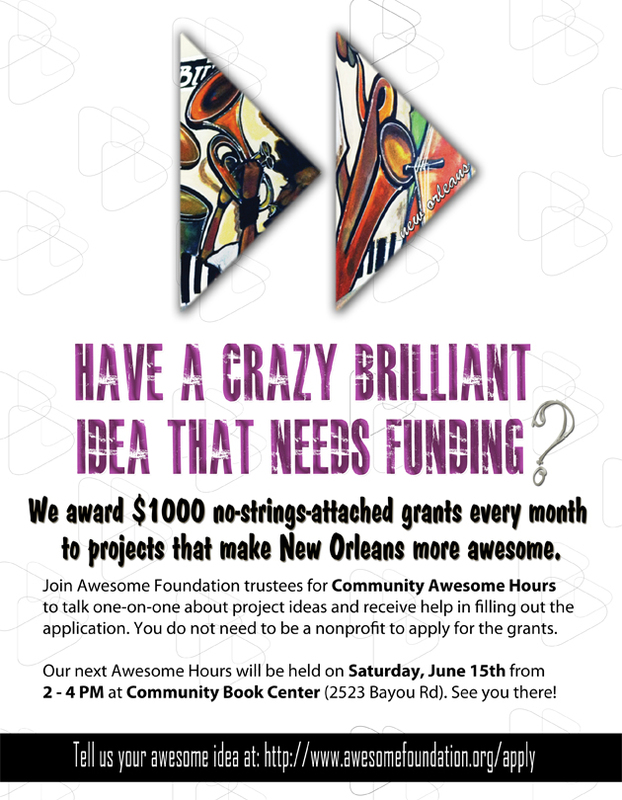 If you’re still unsure if your project ideas fit within the “civic media” project range, keep an eye out for community Awesome Hours each month where you can talk with trustees about your idea or email neworleans@awesomefoundation.org. The New Orleans chapter of the Awesome Foundation has officially launched! Please join us for the launch of the Awesome Foundation New Orleans from 6-8p.m. at Propeller on Thursday March 14th. We’ll have food, drinks, live music and a presentation at 7 about what Awesome is and how you can get involved. We are now also accepting project proposals and encouraging you to sign up for Awesome Tax – a way for you to pledge a small amount of money each month to help bring these projects to life!